A F1-season isn’t static. The cars change, the drivers get better or worse, a season is dynamic. We tried to capture that and actually we are satisfied with the way the cars develop through the season with all the upgrades that can be installed. One thing that has been missing in all our F1-mods no matter the game are the driver changes. Yuji Ide left Super Aguri, Montoya left McLaren, De La Rosa took over, Jaques Villeneuve left BMW and Robert Kubica got his seat. This are just some of the changes that happened through the grid and that we liked to have simulated as well, but unfortunately there is no interface to do this. Since the fundamentals are missing, there is nothing we can do about it. We did like we did in all our seasons and used the grid of the last GP for the whole season. Name tags on the cars are accordingly and ignore the drivers that drove the GP originally. We are sorry for the fans of the drivers who left during the season, but we can’t please everyone. Already for F1-2005 there have been requests to support the third drivers who only drove during the friday practice. Mostly leagues trying to use this for their events. We did some small testwork on the 2005 mod to try, but adding the drivers didn’t really work, because the third drivers can’t be disabled for the qualifying and would start in the GP as well. We didn’t like it and didn’t develop it further. On a sidenote, because we (as in me) planed to make it easier to support more drivers on one car texture, we tried a new mapping, which was screwed and not adopted in the longrun. We ended using the same mapping style as in 2005, except less consistent (switching left and right sides, argh), which is bugging me everytime. Obviously, this is another limitation by rFactor. Not much to say actually. 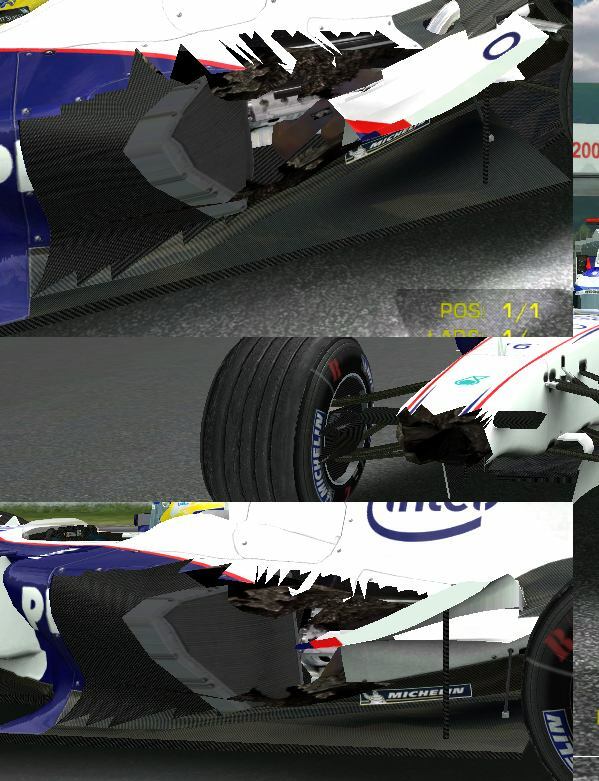 We sketched some ideas how to make it better, nicer, Marco worked on some internals, 3D-engine, gearbox, cooler and Andy took the BMW 2006, our first finished car and added the same damage-parts as in the 2005 mod, added the technical parts and made a few screenshots. It looked good and it was an horrendous job. The number of elements increased dramatically, the bodywork parts had problems with their normals and in combination with the proposed upgrade system, it wasn’t really managable. We thought complexity was enourmous and it was clear we could only do one thing: either damage or upgrades. We chose upgrades, because rFactor is one of the few games, which has a full upgrade interfaces, which we could use and becaue upgrades are something which actually influences the driving. Damage would have been just eye candy. We didn’t use the breaking body parts, but kept some of the new elements. So the damage model is more refined, Barge-Boards are added for example and so the upgrades helped the damage model a bit. PS: Another sorta lost feature, originally I thought the upgrades could be selected freely ingame. Today, when I see the amount of things you’d have to upgrade for a single GP, I completely understand why the system was based on track-configurations, instead of single upgrades. Better keep your brain and drive. I so hoped for it. Would you make some addon for this? It is too bad that there is not new damage model, but you have made so amazing job with this mod already so we dont actually cant demand it. 😀 This waiting is killing me! From my end, Another thing we didn’t manage, but I always had in the back of my mind was to have different steering wheels for each GP round for all the cars. Some examples, Kubica and Villenueve had different handles and slighty different layout, but along with the drivers names we didn’t implement that as already said. When I joined just over a year ago, most of the steering wheels were yet to be done. Only mclaren Williams and Toyota were done at this point, so that was my main task to begin with. When I began examining the photo material we had I soon realised what a pain F1 is 🙂 If you look closely at the wheels for each GP in reality, often many Teams have subtle differences from roud to round, sometimes it might be one button a different colour, sometimes a small shape difference, a screw in a different place,you name it, there will be something, largely owing to the fact that in reality many of these things are hand crafted for each round. 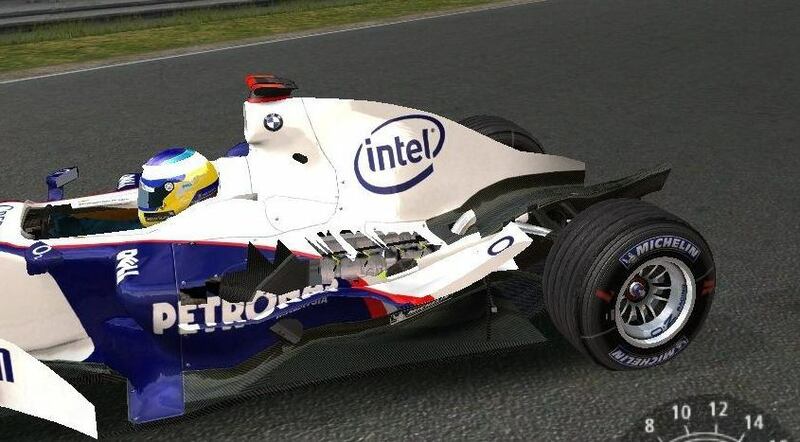 BMW sauber were a pain for this, on the net you will find loads of different versions of their wheel used in tests, races etc. In the end we settled for one steering wheel per Team with exception of those with a track map. some of them will have one, as per reality when the track map is on the wheel. The last few days we had one case open all this time about the Williams version we had for the wrong season but we decided to leave it till last,It wasn’t that the wheel we already had wasn’t nice, but was just the wrong one/model, so I am redoing that mostly now to be finished later today for inclusion in the final release. I´m really glad tbh, JPM driving a Mercedes is the part of his career I´m trying to forget the most. One question. Can the car be damaged by other debris like for example. 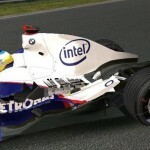 Can a front wing destroy a front wing when its runned over. Toby i dont know where you see a 2006 Car in this video. Well, i do. 😛 I realised after i posted. Wouldn’t one way to implement all drivers that drove during the season be what IDT did with their Champ Car mods? Just create all drivers for the teams and then use an opponent list that the player can choose for every GP. I’m sure that somehow you could force the right driver list for the right GP like with the car upgrades. You guys probably already thought about that but thought I’d put it out there :p.
we have enhanced collission models for each car that take that into account somewhat, it is not a perfect solution, but for sure it’s better than the default, or the way CTDP05 was. Wow, thanks for the rapid reply … Really looking forward for the mentioned enhanced collision model … I am sure it will be very much enjoyable mod than CTDP 2005, although 2005 was already a fantastic mod … Thanks again CTDP ! Previous Previous post: Read me, oh my god, read me!